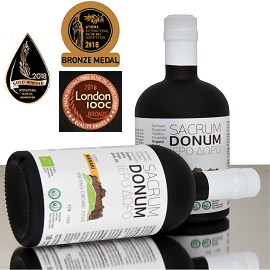 Eager to speak directly with consumers, these two enthusiastic producers invite visitors on an intriguing journey through the mill and the production methods to the resulting extra virgin olive oil. To join them, set out on Crete’s national highway, exiting at Kolymvari. Drive inland past a few villages, through rolling hills covered with some of the most picturesque olive groves on the island. After passing the houses in the little village of Astrikas, you’ll find Biolea’s long drive on your right. Chloe says she and Eftychis teamed up to work on this seminar because “we have a common passion, a common vision, and we communicate well. I wanted to do a seminar, and it seemed like a good idea to do it with two different producers with two different olive varieties, two different methods, both of the producers here, explaining our experience, our hard work that we’ve put into making olive oil.” Eftychis agrees that he and Chloe have “the same ideology, the same love of organic quality.” And so an unusual collaboration began. Chloe and Eftychis share a dedication to organic production, sustainable farming, and excellence achieved with the help of continuing education, improvement, and innovation. They both choose to “keep it sustainable,” as Chloe says, without irrigation or fertilizer, as Greeks farmed for thousands of years. This means fewer olives and less profit, they agree, but better quality, they believe, with more intense aromas and more healthy antioxidants. 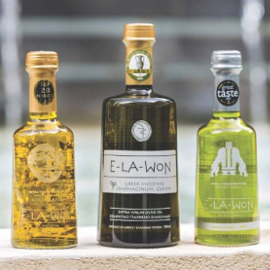 Chloe works with Greece’s most common olive variety, the tiny, hardy, drought resistant Koroneiki, while Eftychis focuses on 11-12 meter Tsounati olive trees, Crete’s traditional high-altitude, cold resistant trees and one of the oldest varieties in Greece. Chloe uses the traditional stone mill and hydraulic press set up by her father George, while Eftychis conducts dozens of experiments each year at a modern olive mill run by his colleague Michalis. For their talk and tour, Chloe and Eftychis gather a small group of international visitors next to Biolea’s olive grove and start where it all begins: with the olive tree. Smoothly alternating between descriptions of their different olives and methods, they take turns discussing their organic farming, pest control, and harvesting processes. They occasionally call each other “crazy,” turning a word traditionalists use to deride them into a compliment for their innovative, perfectionist ways. Moving over to the conveyor belt that transports olives into Biolea’s mill, they discuss the next steps in the process. Inside the olive oil factory, Chloe introduces Biolea’s stone mill. They have “kept the simplicity of the old traditional method,” adding modern updates for health certifications. 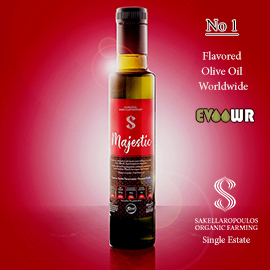 While Chloe acknowledges that “most people think it’s crazy to go backward,” she prefers the old way that does not add heat or water to damage quality and yields a milder, very healthy extra virgin olive oil (EVOO). Standing next to the three-stone mill, Eftychis explains that the modern hammer mill he uses also crushes olives into paste, after which a malaxer connects tiny molecules in the paste, like a blender, for both him and Chloe. Chloe tells us how she puts the resulting olive paste onto pressing mats so the hydraulic press can squeeze out the liquids. Eftychis reveals that a decanter does the same job for him, using centrifugal force to separate the solids and liquids. The comparison between Biolea’s basic, easy-to-understand machines and the modern ones Eftychis describes provides a unique introduction to the olive oil production process for the uninitiated. We also learn about the difference between Eftychis’s filtering of his olive oil and Chloe’s oil’s natural settling in a tank. Once we have looked into Chloe’s bottling and storage room, we head upstairs to a mezzanine area that overlooks the mill and press to watch a short video of Biolea’s harvest and production. Then we move on to the adjoining event and exhibition venue to sit down for a slide presentation and tasting. 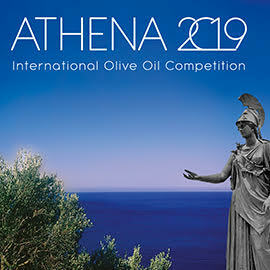 Eftychis and Chloe offer a wealth of information about global olive oil production, grades of olive oil, enemies of olive oil (oxygen, light, and chemicals), the best types of packaging, and cooking with olive oil (with much of the info reproduced in a booklet to peruse at home). Since “both of our oils are directed to the health conscious consumer,” as Chloe points out, Eftychis goes into some depth on olive oil’s health benefits (due to monounsaturated fatty acids, oleic acids, phenolic compounds, and Vitamin E). We are introduced to olive oil tasting with an overview of positive and negative flavors and aromas, a glance at an olive oil tasting wheel with 72 different terms, and some tasting tips. 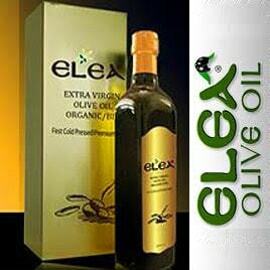 Then Chloe and Eftychis present their extra virgin olive oils. We start with the milder Biolea EVOO, then move on to Pamako’s two more bitter and spicy (yet balanced) blended and monovarietal EVOOs, finishing with Biolea’s lemon and bitter orange olive oil condiments, which are made from organic fruit crushed under the millstones along with the olives. 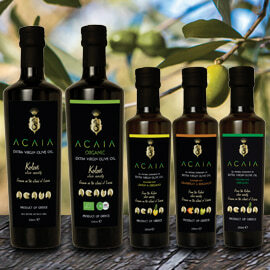 We discuss the oils’ flavors and aromas, as well as possible pairings with different types of foods. We finish the evening by lingering on Biolea’s terrace, enjoying Cretan snacks with olive oil and local wine along with a dramatic view of the sky after sunset, lit by the afterglow beyond the hills on the far side of the olive groves. Our informal conversation drifts to the olive oil factory where Eftychis makes his Pamako EVOO, with “a lot of buttons – like a Christmas tree,” so it requires a great deal of attention, leading him to sleep at the factory thirty times last autumn. Chloe tells us how much she learned from her father George, “a university on his own--we call him Georgipedia.” While more traditional, disapproving villagers asked, “what are you doing to your daughter?” he told Chloe “to do everything from 0 to 10” if she wanted to take over the business—everything from cleaning the gutters to working in the fields. She appreciates that: “This gives me the power to say ‘I can do it.’” That could be the motto for innovative young Greek olive oil producers like Chloe and Eftychis.